Alleys are one thing that attracted me to St. Louis in 1990, we didn’t have them in the 1960s suburban subdivision where I grew up in Oklahoma City. Interestingly, my grandparents each had alleys behind their homes in the small Western Oklahoma towns of Weatherford & Clinton. I spent a lot of time in the alleys behind their houses. Everywhere I’ve lived in St. Louis has had an alley, though for the last decade the alley has technically been St. Charles Street. In April 2012 I posted about the streets that are really alleys parallel to Washington Ave.; St. Charles Street to the South & Lucas Ave to the North. 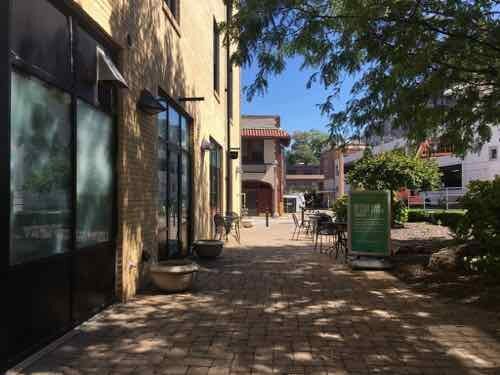 A year later New Brewery Improves Alley-Like Lucas Ave.
A recent “Where am I?” photo on Facebook raised interesting issues about alleys, and led me to ban someone from commenting on the page. Let me explain. 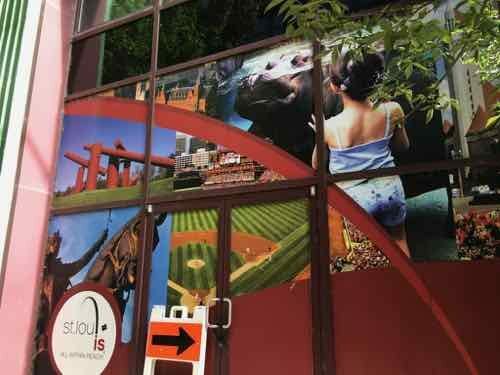 I posted the photo to the right on Facebook (blog’s cover image) with the caption “Where am I?” There were right & wrong guesses as to the location — it’s off of Locust St. between 10th-11th. One of the comments was “A sketchy alley about to get mugged by a homeless guy with a shank. Also next to the Urban Shark.” Yes, Urban Shark is attached to the Bike Station on the left. No, not at any risk of getting mugged, but many think that way about alleys. One person commented we need to turn alleys into pedestrian-focused retail like other cities have done, citing San Francisco & New Orleans. I recall experiencing one in Vancouver years ago — great space. 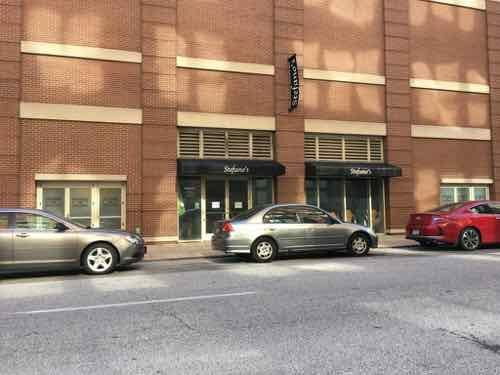 However, I replied that retailing has struggled downtown even on well-populated streets like Washington Ave. Later I asked him to name just one alley downtown that would make a good candidate for retail. He, we’ll call him GB, said I was bashing St. Louis and he’s seen it work well in other cities. I’ll post more on our interaction in the future, right now I want to stick to GB’s assertion we should enliven our alleys. Our alleys, like in many cities, were planned as ways to keep unsightly business like trash disposal out of view from primary streets. Also, most of downtown’s alleys have been privatized. 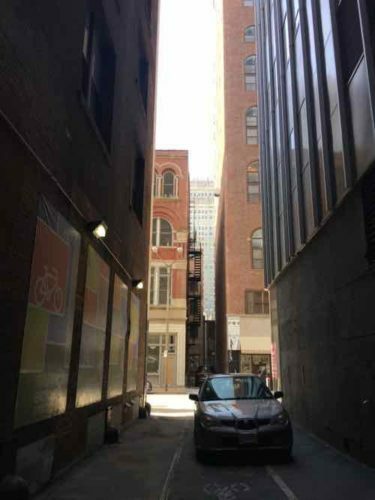 Certainly those who own to the rights to formerly public alleys could try to market an alley as a pedestrian-friendly retail & restaurant hub, though ownership is often split down the middle between property owners on each side. Yes, this has worked well in other cities. 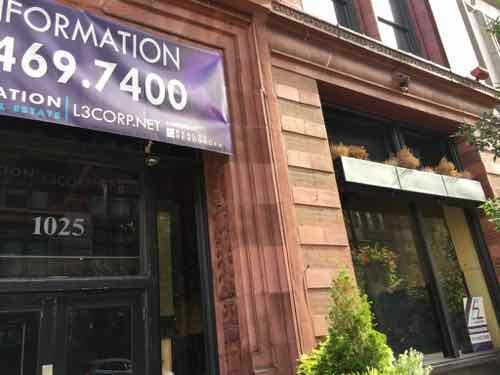 So why not downtown St. Louis? 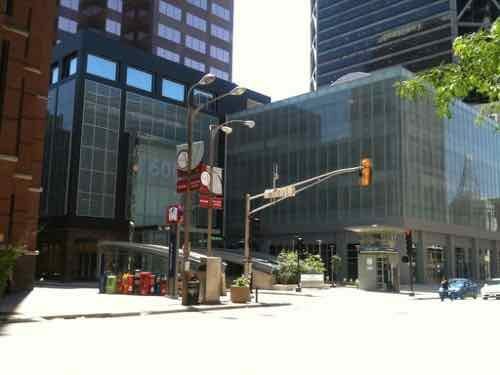 First, this has been used in areas lacking vacant street-facing retail spaces. When retail vacancy is near zero rents go up. By expanding into alleys building owners can make retail spaces in unused/unleased portions of buildings. The rents received isn’t what they get out front but it helps the bottom line. Retailers get spaces that are more affordable in their business model. If we look at the immediate area around the alley I posted we can see lots of available storefront space. Lots. The corner space on the building to the East is vacant. Same for the corner space on the building to the West. Diagonally across 10th & Locust from the above, the corner of The Syndicate remains vacant. 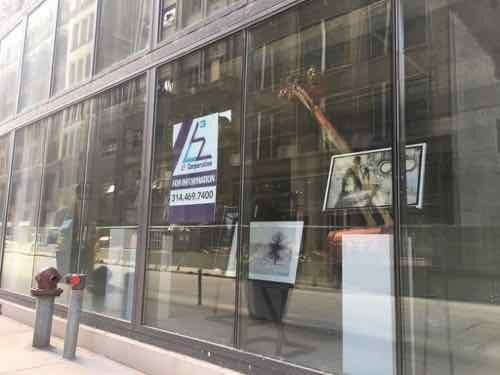 Stefano’s former space at 504 N 10th has been vacant for 3+ years. The South side of Washington Ave between 10th & 11th recent became fully occupied, but the North side has lots of vacancies. 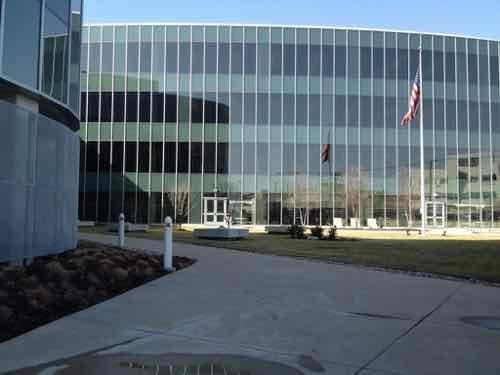 The Dorsa building was renovated more than a decade ago but ground floor retail remains vacant. 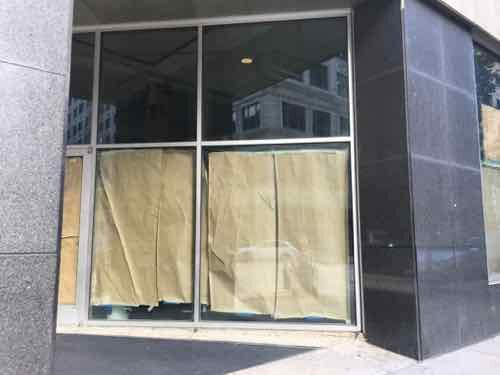 The other storefront in the Dorsa is also vacant. Years ago the St. Louis convention people made the windows look nice at least. 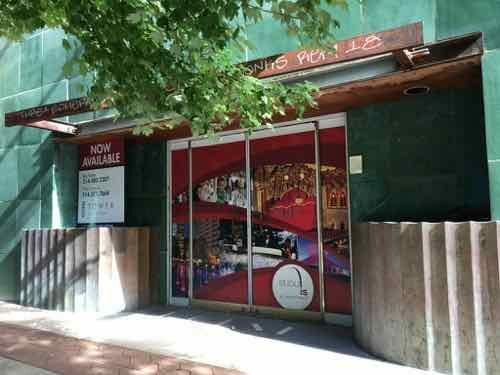 Two months from now will mark 3 years since The Dubliner closed, the space remains vacant. 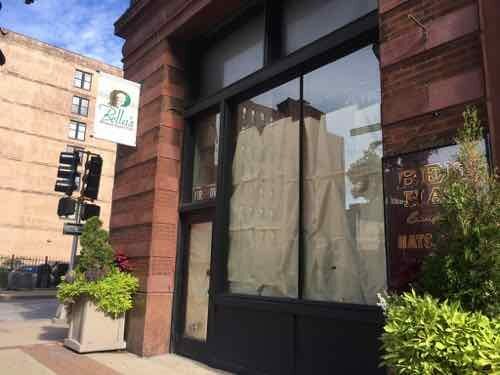 One bright spot is someone will soon be reopening Bella’s Frozen Yogurt at 1021 Washington Ave. Yay! Click the image to open their Facebook page in a new tab. 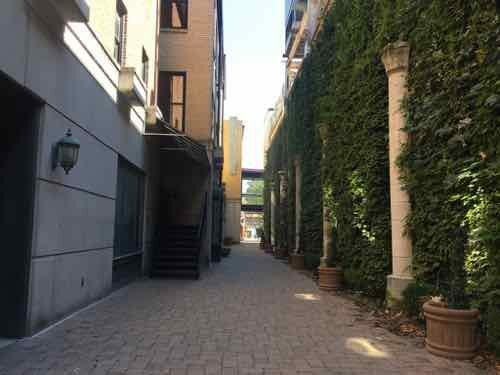 I’ve tried to think of an alley in Downtown or Downtown West that might be a good candidate. 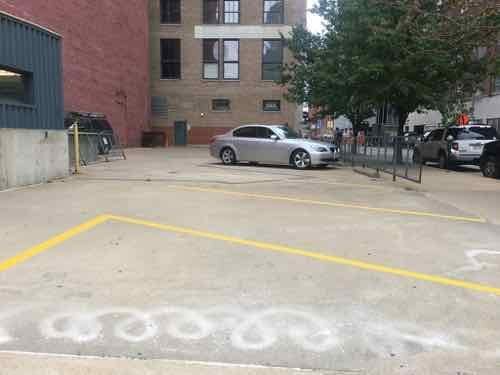 Laclede’s Landing — can’t think of one, North of the Arch/Ead’s Bridge, has done ok with an alley or two to gain access to buildings. 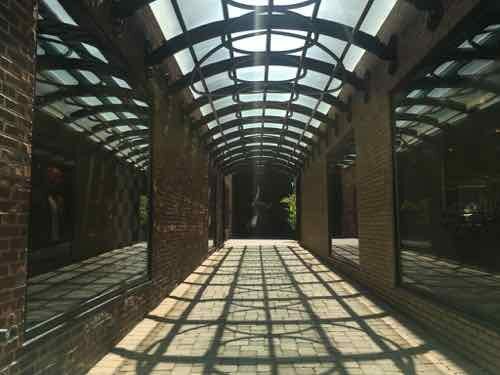 The best local example I can think of is the Maryland Plaza alley in the Central West End. The property owner(s) did a great job welcoming you to the back of the buildings. 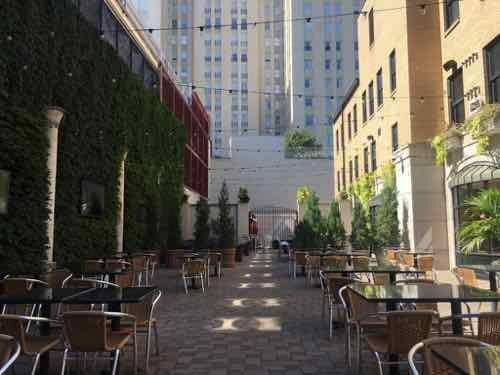 A restaurant patio occupies the West end of the “alley” behind the buildings. This photo was taken on a hot Thursday afternoon, I’d imagine it’s hard to get a table here at certain times. Looking East toward York Ave., we see a living wall to disguise the parking garage on the right. 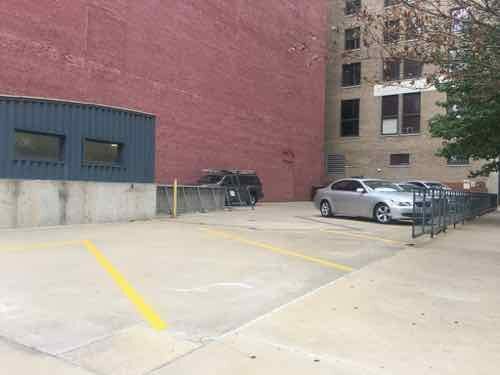 This example was never a public service alley, but it does show how a small sliver of property behind a building can become an asset rather than a liability. 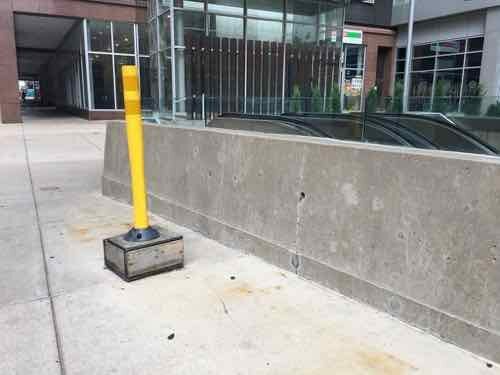 Former service alleys can be given this same treatment, the results are often amazing. Still doesn’t make it a good idea for downtown St. Louis. It might, if you can think of the right location. Section 504 was added to the Rehabilitation Act of 1973 four years later, in 1977. It has been over four decades since we first began to construct buildings accessible to the disabled, and more than three decades prior to my becoming disabled due to a stroke in February 2008. Though significantly better than they were decades ago, things still aren’t quite right. Today a few of minor examples: public restroom soap dispensers & trash receptacles. After using a public restroom the ability of me to use soap to wash my hand depends on access to the soap dispenser. At the Culinaria grocery store downtown the two soap dispensers are wall-mounted very high in corners. When I’m in my wheelchair it takes a lot of stretching to reach the one on the right. Not everyone who uses a wheelchair can stretch that far. 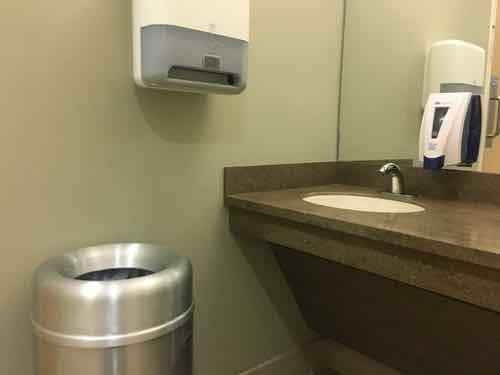 At Solae (now DuPont) at CORTEX, the soap dispenser is on the side of the sink — much easier to reach — but I still can’t get any soap from it. This dispenser is very long, it’a designed for use with two hands — one to press down so soap comes out on the other. I have two hands, but use of my left remains very limited. Shorter dispensers of this type I can use one-handed, pressing down at the back while getting soap on part. Long dispensers like the one at Solae/DuPont is completely useless to me. 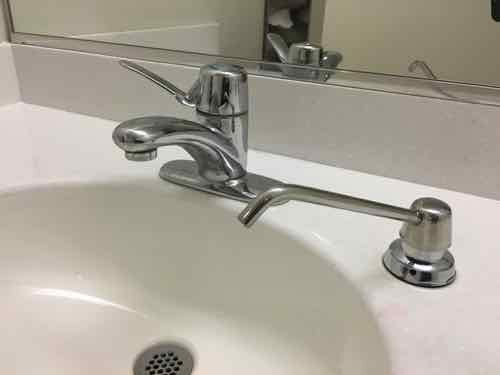 Soap dispensers are, generally speaking, specified when buildings are designed/constructed. My other issue is with trash receptacles, this is either because a good location wasn’t part of the original design or the occupants moved them to be in the way. 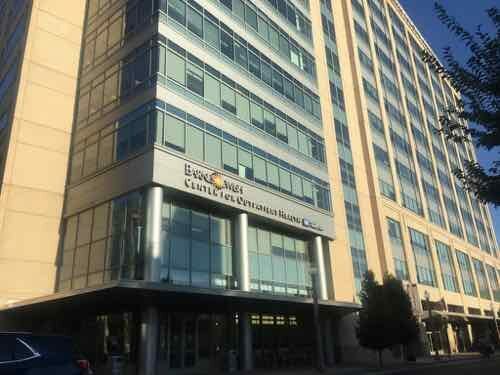 I love how the main entrance off Euclid is a very wide ramp, with steps off to the side — the opposite of so many older buildings with wide steps and a narrow ramp on the side. 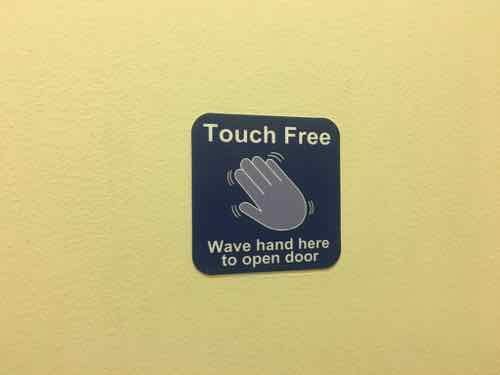 I also love how inside they have touch-free “buttons” to open bathroom doors. Thankfully the first floor bathroom has two sinks & paper towel dispensers, because the trash receptacle prevents me from reaching the left side. These soap dispensers are mounted low enough to be usable. In the restroom above there really is no other spot where a trash can could be located. This might have been a good candidate for one under the vanity with the hole in the center, or a wall-mounted paper towel/trash unit. To make matters worse, what doesn’t work for me may work great for another disabled person. And vice versa. The take away from this post is details matter. Architects, designers, facilities managers, occupants, and owners of public buildings need to think about the little things. 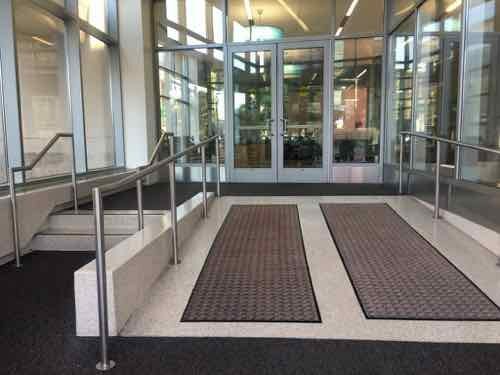 Hiring a disability expert to review projects during design can reduce user issues. Still, I’m grateful for the ADA, building codes, etc. that have made public restrooms significantly better than they were decades ago. 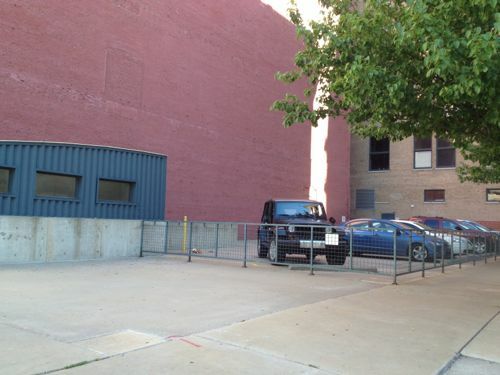 The fenced surface lot is over the underground parking for Louderman Lofts building. 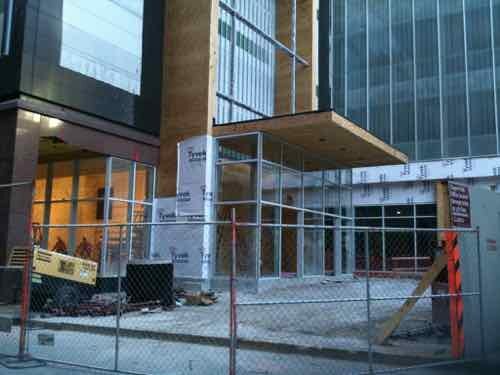 A few years ago I used this image in a post suggesting a small retail kiosk/building at the 11th/Olive corner. 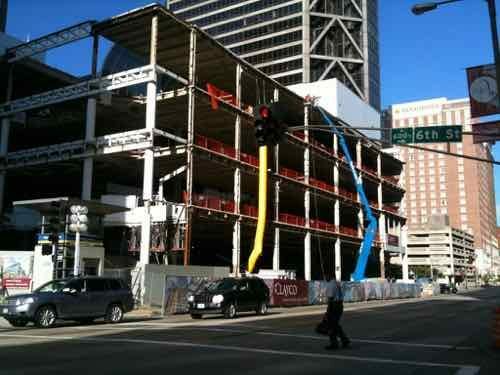 The developer confirmed it was built to handle that. Change did come to this corner in June 2017, but not in the form of an urban building to establish the corner. The parking lot was reconfigured — possibly without city approval. 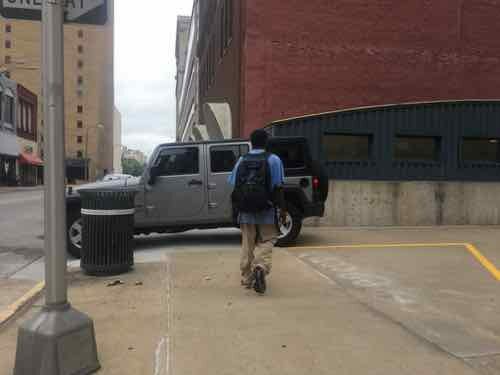 June 22, 2017: A Jeep is pulling out of the one fenced-in parking lot. 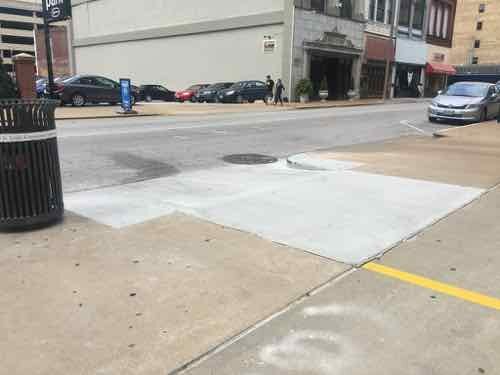 A new curb cut was created. This is just East of their basement garage drive. Looking toward the lot we see the South fence section removed. Closer up we can see the old fence leaning in the background. 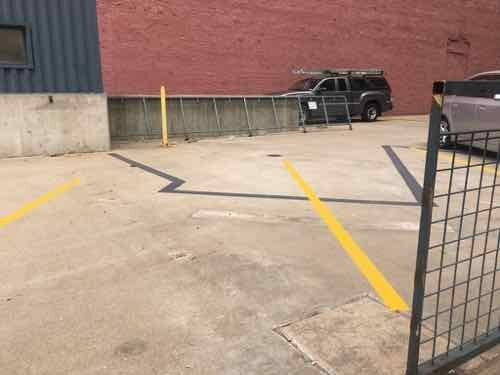 Either the Louderman condo association did this without the city’s blessing/permission OR the city ignored their own parking lot requirements regarding minimum space size and fencing. This lot once used the existing alley for access, now we have an exit onto Olive. 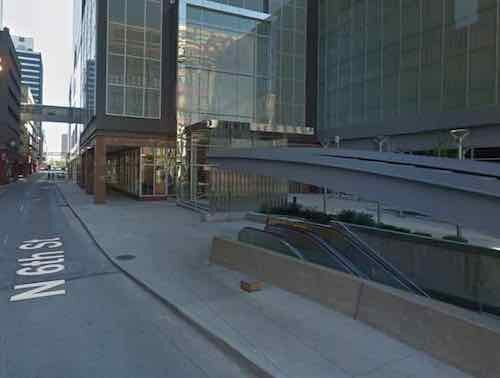 It was bad enough watching for cars entering/exiting their underground garage, not pedestrians must watch for vehicles exiting this surface lot as well. 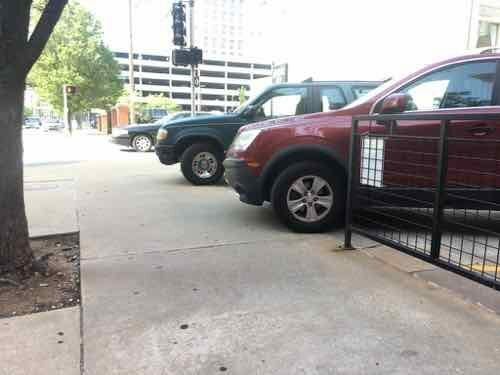 The sidewalk is narrowed by the cars encroaching. Either way it’s annoying, ugly. 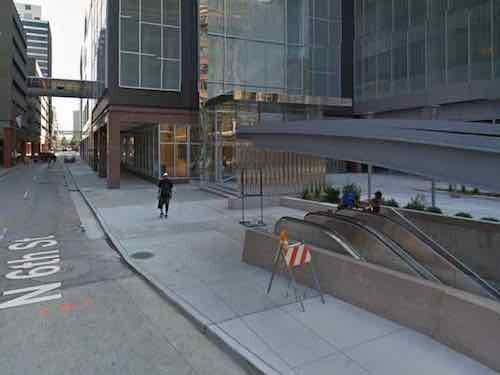 I’ll be sending a link to this post to numerous people to find out A) was permission granted for the curb cut change and B) if there’s anyway to require parking stops &/or continuous fencing to keep cars from encroaching on the sidewalk. 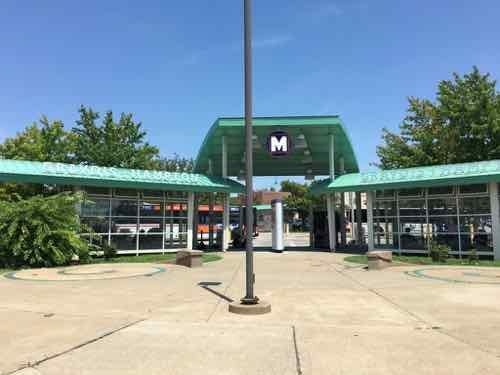 Usually when I go to my regular doctor I take either the #97 (Delmar) MetroBus or MetroLink to connect with the southbound #90 MetroBus at Goodfellow or Forest Park station, respectively. 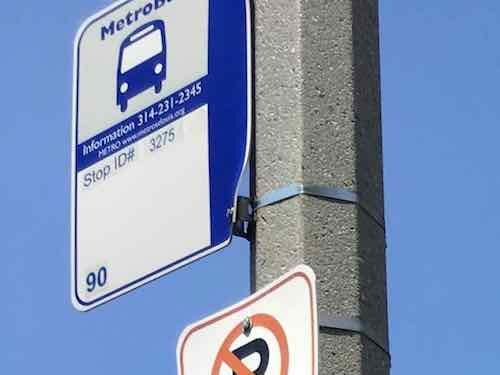 However, depending on the bus schedule and my appointment time I’ll take the #10 MetroBus from Olive @ 16th to the Gravois-Hampton MetroBus Transit Center, and then catch the #90 MetroBus heading northbound. The alternative takes about 15 minutes longer, but often will get me to my destination closer to my appointment time. But I only take the Gravois-Hampton alternate if it hasn’t rained recently. 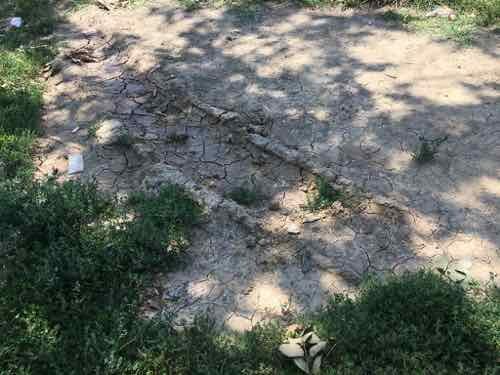 You see, the bus stop I use to catch the Northbound #90 is a muddy hole if it has rained recently. 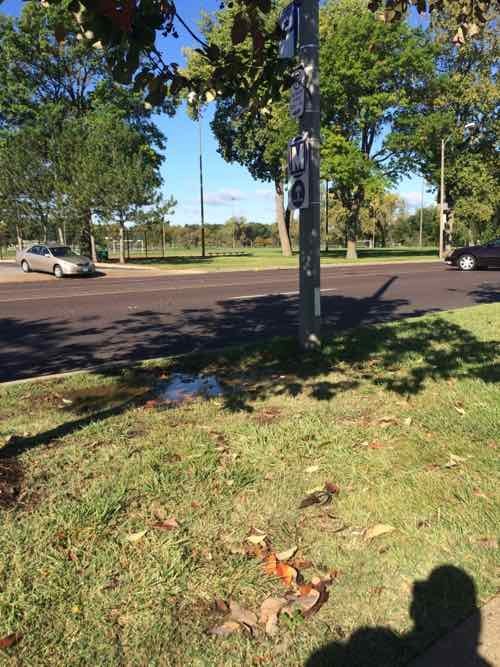 The bus stop is where thw standing water is on this October 2014 photo. ‘The Northbound #90 bus stays on Hampton rather than pulling into the transit center. Riders getting off/on must use the grassy tree lawn. Looking North, note the bus stop sign is mounted very high on the poll — and facing the street. I couldn’t read the stop ID from my wheelchair. The tree lawn is quite wide here, you can see how the grass is well-worn. Even dry this stop is a problem when boarding. 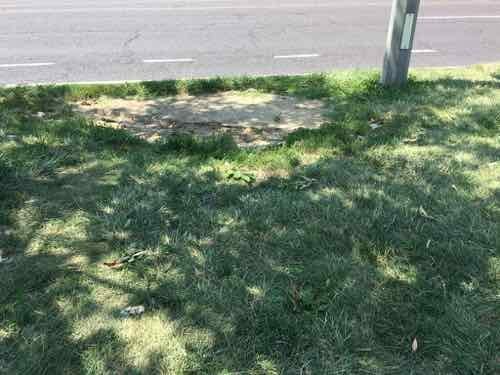 When the bus driver puts out the ramp/lift it leaves a huge gap my chair must get up — this is because all the use has worn this spot down so it’s lower than the curb and surrounding grass. Recently I was waiting in the grass just before the stop to avoid this problem. It’s adenegrated experience for everyone dry or wet, impossible for us wheelchair users when wet. 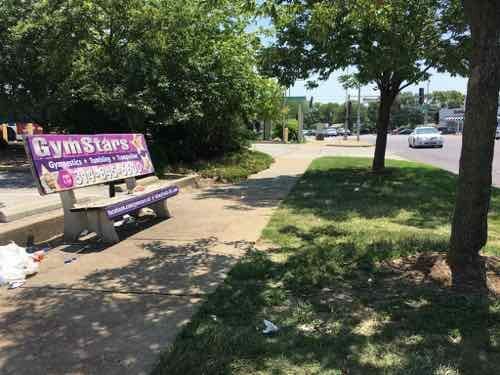 Metro occasionally gets grants to improve accessibility of MetroBus stops — #3275 needs to be toward the top of the list for improvement. 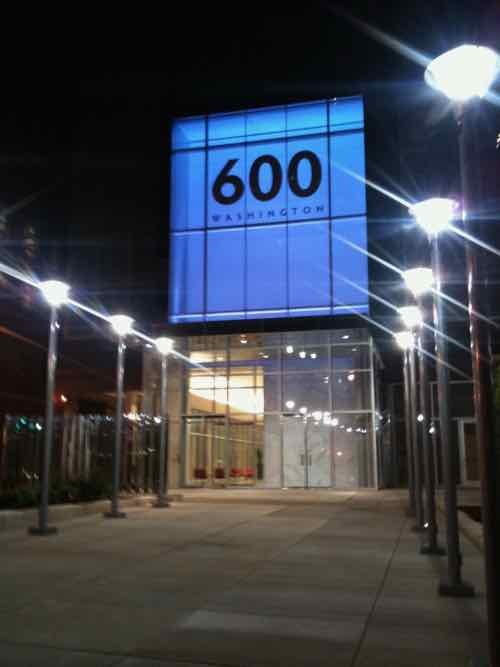 Last month I began going to the Downtown YMCA at the MX to workout (thanks AARP Medicare Plan). Locust would be direct, but crossing 13th in a wheelchair is awkward and construction has the sidewalk on the North closed at 10th. So I take Washington Ave East to 6th. 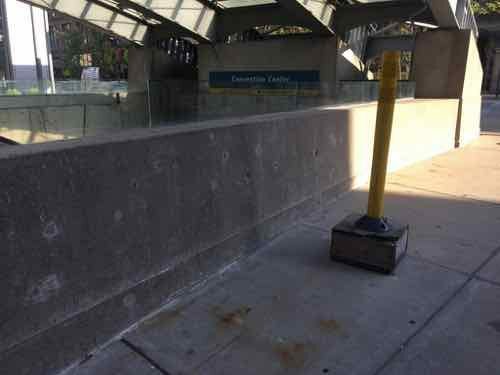 It was there, next to the Eastbound Convention Center MetroLink station entrance, I encountered an obstacle. A wooden box with a yellow stick on top. At times I’d be meeting someone walking the other direction, one of us had to wait (usually me because of direction) while the other went by. I snapped this photo on July 11, 2018 — my 6th visit to the YMCA at the MX. I didn’t share the pic. When I got home I pulled up the link on my computer — Google Street View allows you to see current views, but you can also go back to see older views. I also looked through my photos to see why I had. Below is a mix of Google Street View screenshots & my photos. First, background history. The Convention Center Metrolink Station opened on July 31, 1993 as part of our original light rail line. 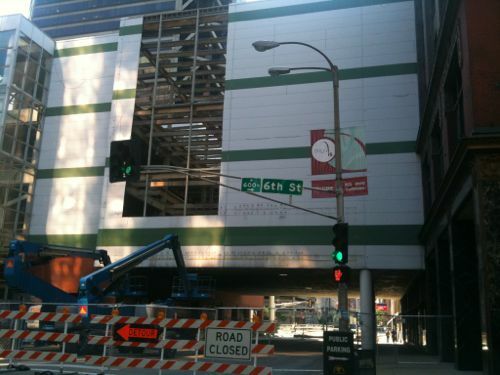 The Eastbound entry/exit is located on the SW corner of 6th & Washington. Eight years earlier St. Louis Centre indoor mall opened. So opening a transit station adjacent to a mall is a good thing. 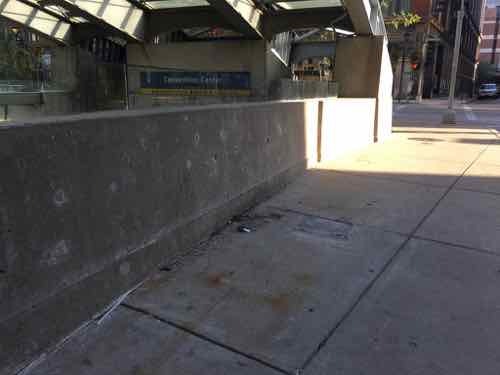 After helping to kill downtown’s sidewalks, the mall closed. Looking west from 6th Street on May 22, 2010. 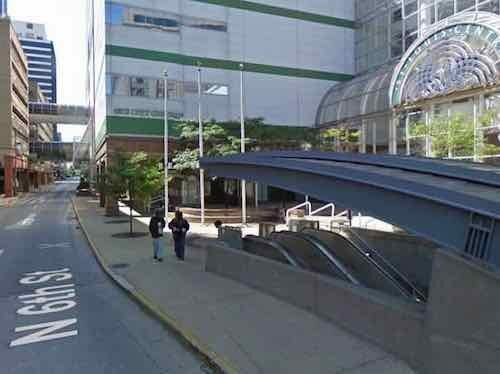 The oppressive skywalk over Washington Ave would soon be removed as the indoor mall was turned into a parking garage with sidewalk-level retail. 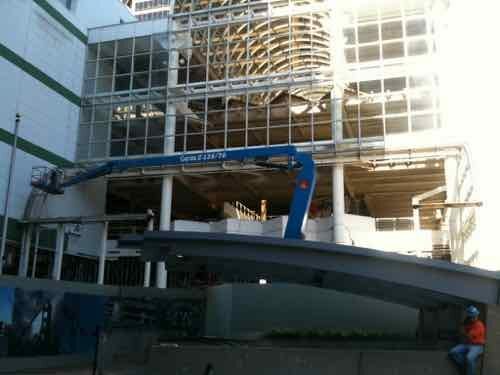 The adjacent office tower would also get a new entrance facing Washington Ave.
July 16, 2010 — the glass facade is being removed. 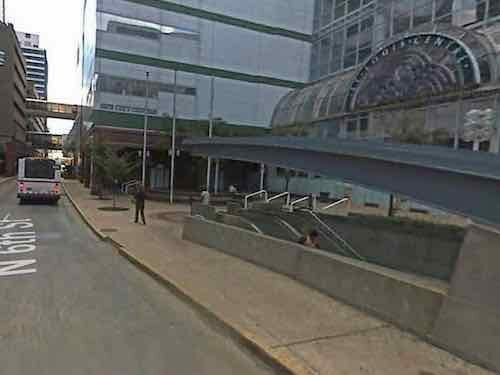 August 8, 2010 — — the bridge/skywalk is gone along with one bay of the old mall. April 29, 2011 — new sidewalks are poured, new lighting installed. Zooming in we can see 4 bolds sticking up from the newly poured sidewalk. Seeing the bolts made me think perhaps Metro planned some signs, I remember seeing new signs about this time. 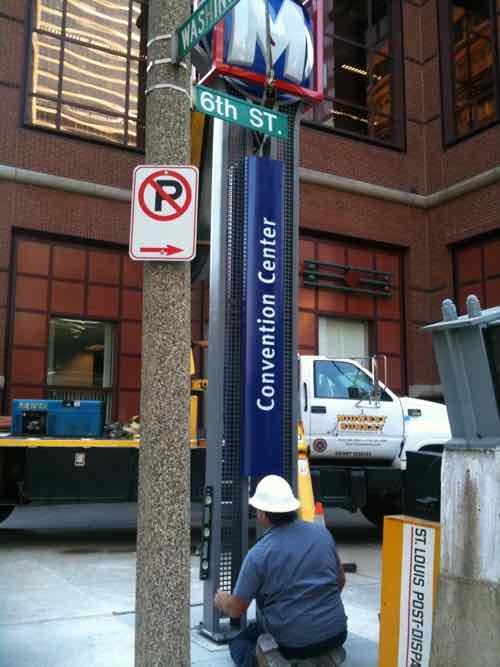 October 11, 2011 — a worker installs a new sign on the other side of 6th. Recently I noticed this sign has a large base, way too big for the four bolts across the street. Perhaps a smaller version? 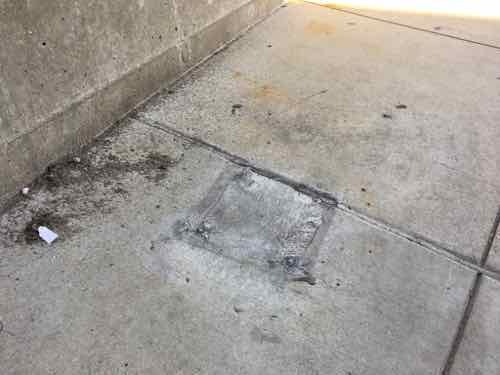 April 2015 — at least 4 years after the sidewalk with 4 bolts was poured a wooden box now hides them. The box looks weathered, itself a trip hazard. july 2015 — the box is still there unmarked. 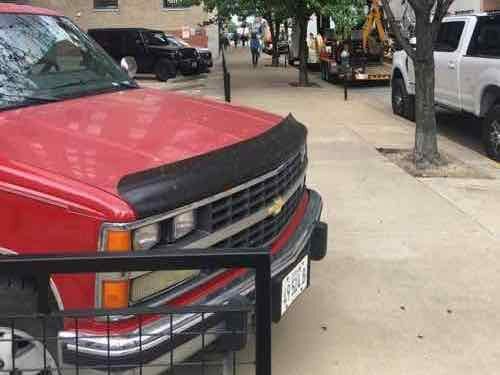 A Sherif’s van is parked on the sidewalk because that’s what we do in St. Louis. So when I posted about this on July 19th it had been an issue for over seven years. Seven years! Either Metro or the MX developer planned something that was never going to be installed. 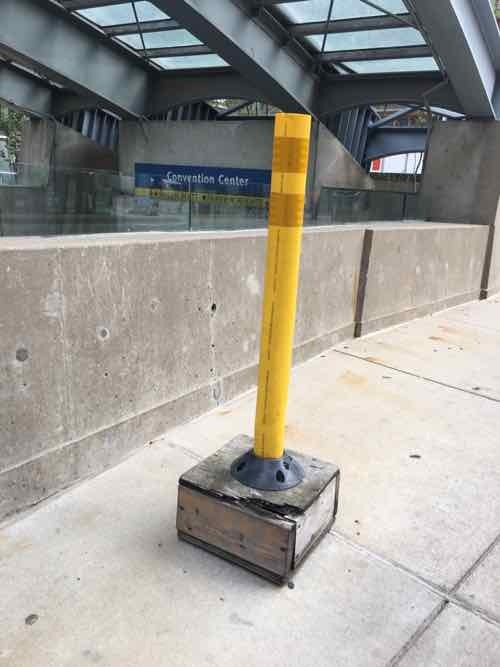 Rather than cut the bolts off they built a wood box, then later added a yellow pole to said box to prevent people from tripping. 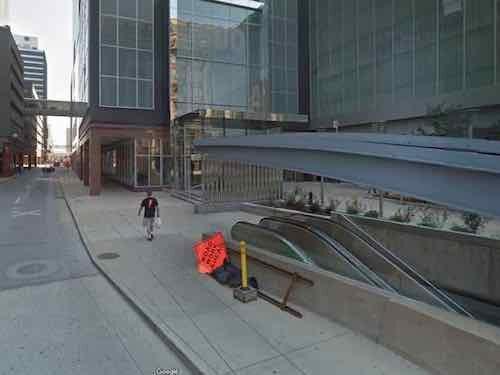 I know this is just one little sidewalk on a side street, but it illustrates how little concern there is for the pedestrian experience downtown — right next to a transit station. The box & pole were still there on the morning of July 25th, but July 28th I came around the corner and saw they had been removed and the bolts cut off. 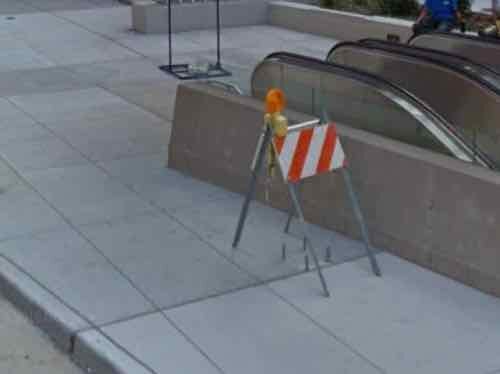 It wold’ve been cheaper if the bolts had been cut off years ago, or realize the sidewalk was too narrow in the first place and the bolts not put in there in the first place! In the big scheme of things St. Louis still has major problems, in that context this is insignificant. 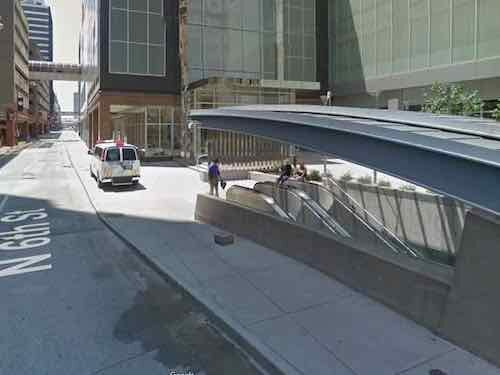 To me and others who use this sidewal, it is important, There are still hundreds of other issues I deal with just downtown. I can’t solve St. Louis’ big problems, but I’ll take on small issues one by one. Cities in which residents & tourists have challenges as a pedestrian are not going to have bustling sidewalks. Downtown retail/restaurants can’t survive without foot traffic. 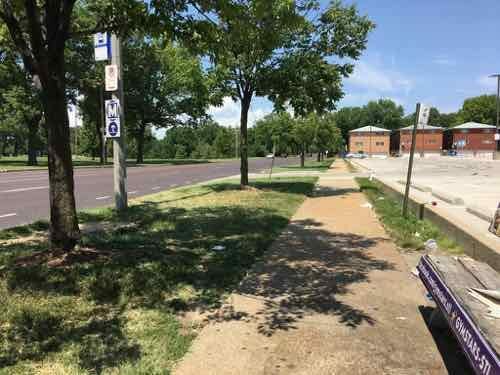 St. Louis would be wise to make life easier for pedestrians all over the city — but especially around major transit.